Modern convertible sofas embrace simplicity with great functionality. Their minimalistic designs are fresh and airy but very practical. A modern convertible sofa can also be utilized as a lounger and a bed while its simple and decent style is very appealing to the eyes. They lack unnecessary adornments but are synonymous to versatility. They may include matching throw pillows and bolsters, headrests or storage space depending upon their design. The luxurious Latitude Run Leigh Sofa offers you maximum comfort with stylish look. It features alluring beige color with black base, tufted cushions and stylish arms and legs that add to its aesthetic appeal. It has single cushion seat thickly filled with foam which is immensely comfortable and plush. Its sturdy wooden frame ensures years of reliable use. The sofa is convertible with four seat adjustments for sofa, chaise, lounger and bed. This versatile modern sofa will be an inviting addition to a wide array of living room decors. Can be used as a sofa, chaise, lounger or a bed with its four seat adjustments. Reclines fully to convert in to a bed. Headrest is on the right side of the sofa. Robust and durable wood construction. Tufted and upholstered in soft microfiber fabric. Color: Tan top and black bottom. 7.48 inches thick seat cushions. Maximum weight capacity is 600 lbs. LifeStyle Solutions provide one year limited product warranty. Product care: Spot clean or use a damp cloth to wipe clean it. With the chic and stylish Corrigan Studio Derek Convertible Sofa, you will experience ultimate relaxation and comfort. It features solid wood construction that ensures years of reliable use. 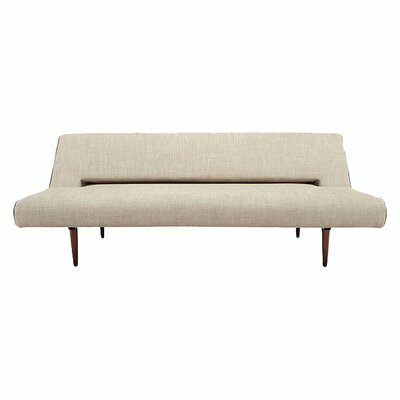 Upholstered in alluring ash colored microfiber, this sofa boasts warm and inviting appeal. It is supported and balanced on six chrome finished legs that complement beautifully with its ash color. The Derek Sofa is convertible and can be converted in to a bed quickly and easily. When it is folded, it transforms in to a square ottoman. You can turn it in to a chair by flipping up the backrest. Apt for residential application, this sofa is very easy to assemble. Four functions: Sofa, Loveseat, Ottoman and Bed. When folded, it converts in to a square ottoman. When fully reclined it transforms in to a queen size bed. Upholstered in soft-to-touch microfiber upholstery. Sofa rests on six chrome finished legs. It requires assembly and is very quick and simple to assemble. Maximum weight capacity of this sofa is 300 lbs. Experience the ultimate comfort with the gorgeous Ara Convertible Sofa by Primo International. 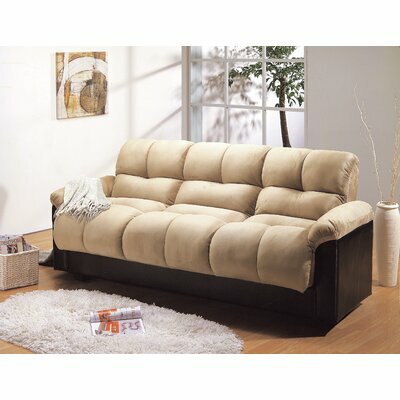 It features plush and comfortable cushions accented with tufts for an elegant look. The lovely Ara Sofa is upholstered in a beautiful combination of hazel and dark brown colored fabrics. The upholstery fabric is durable and fade-resistant polyurethane. This sofa is multi-purpose. You can store your bed linens in the hidden storage space beneath the seat. It easily converts to three different positions including upright as a sofa, lounger and flat as a sleeper. This versatile sofa is a practical choice as seating, lounging, sleeping and storing solution. Reclines to convert in to a comfortable bed. Convenient storage space under the seat. Solid wood construction using eco-friendly materials and procedures. Upholstered in fade-resistant polyurethane fabric. Fabric color: Hazel and Dark Brown. Multiple cushion seat with pillow top cushions. It is very easy and simple to assemble. Maximum weight limit is 700 lbs. Primo International provides one year limited warranty. The modern Wildon Home® Millsap Convertible Sofa will add a trendy touch to your living room. 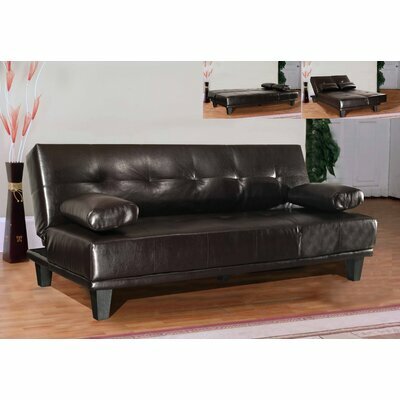 This stylish sofa is upholstered in faux leather which is durable and will last for many years to come. The graceful solid pattern and bold black color add to its visual appeal. It is accentuated with tufts and chrome finished legs. The stunning Millsap Sofa is convertible and when folded flat, it can be used as a comfortable bed. 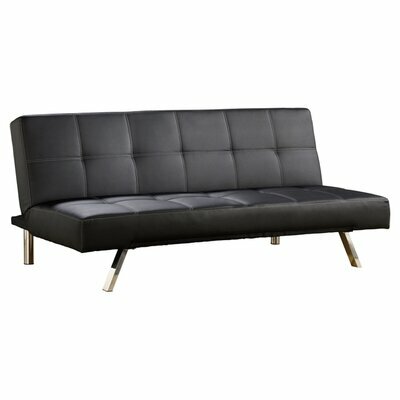 Converts to a sofa bed or a chaise with one side raised. Easily accommodates two to three people. Gorgeous faux leather and vinyl upholstery. Available in more fabric colors including. It requires assembly and comes with hardware pack needed to assemble this sofa. Classy and stylish Gold Sparrow Seattle Sofa is ideal furniture to adorn your elegant living room with. Its modern style with trendy flair will accentuate the décor of any room. Solid wood construction renders maximum sturdiness and durability to the sofa. Upholstered in black and white, the dual tone look with solid pattern adds to its visual appeal. It is armless and offers comfortable and additional seating space. Tufted cushions and chrome finished legs lend a stylish touch. The Seattle Sofa is convertible and features an adjustable headrest for additional comfort and support. This versatile sofa requires low maintenance and is available in multiple finishes to complement a wide array of room decors. Converts in to a cozy bed when reclined. Faux leather upholstery adds style. Upholstery color: Black and White. Also available in more combinations including Brown and Cream, White and Green. It is very easy to assemble with the help of Allen key. With cross generational appeal, the stunning Derryclone Sleeper Sofa dares to boast a chic look. 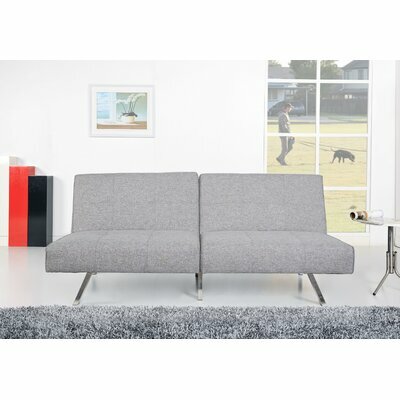 This modern convertible sofa can be converted to a sleeper quickly and easily. Just fold it down and you have a cozy sleeping space. An appealing combination of heavy natch natural color fabric and walnut finished tapered legs create a visual delight. This sofa has an understated elegant flair that will complement any living room décor. Converts in to a full size bed when its folded down. Fabric color: Heavy Natch Natural. Available in more fabric colors including Heavy Natch Brown/Black, Soft Mustard Flower and Soft Pacific Pearl. Tapered legs have walnut finish. Innovation USA provides 2 years limited product warranty. The comfortable and plush Chesire Sofa by Milton Green Star will be an inviting addition to your living room. Dark brown faux leather adds to its overall charm. Two matching bolsters are included for additional comfort. This graceful convertible sofa is three-in-one and can be used as sofa, lounger and a twin bed. Enjoy your Sunday afternoon lounging on it while reading your favorite book or fold it down in to a perfect bed for your overnight guests. 3-in-1; can be used as sofa, lounger, sleeper. Upholstered in dark brown colored faux leather. Seat and back are tufted. Includes two matching bolsters in faux leather. Product care: Use a damp cloth to spot clean it. Great functionality and appealing aesthetic design go hand in hand in the Long Horn Sofa by Innovation USA. Our team of technical masterminds, innovative designers and product developers have worked earnestly by integrating all elements to create a masterpiece. Style statement and comfort blends in this convertible sleeper sofa. Just adjust the back to different settings and enjoy relaxing evening on a lounger or a peaceful night’s sleep on the sleeper. Featuring avant-garde design with versatility and optimum comfort, this Long Horn Convertible Sofa is a must have in every modern living room. Three functions: Sofa, lounger and a bed. It easily converts in to a comfy full size bed. Fabric color: Soft pacific Pearl. Available in more fabric colors including Basic Dark Grey and Mixed Dance Natural. Sofa is supported by white wheels on back and stainless steel legs on the front. Maximum weight capacity is 475 lbs. Upgrade your living room décor with the stylish yet graceful Hunter Convertible Sofa by Sauder. Manufactured from premium quality wood, this sofa ensures reliability and durability for many years to come. It is upholstered in warm and alluring chocolate colored fabric that lends visual delight to its overall look. The upholstery material is soft microfiber fabric which is stain resistant and fade resistant. 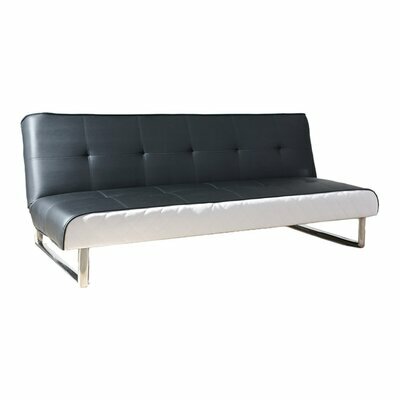 Tufted cushions and chrome finished legs accentuate this convertible sofa. The center console flips down to reveal hidden storage and cup-holders. Easily transform to a comfortable bed when the back is folded down. It requires some assembly. You can place it in any corner of your home including your living room, bedroom, patio or porch. Dual purpose: Can be used as both sofa and a cozy bed. Easy click-clack adjustment allows effortless transformation from sofa to bed and vice versa. Flip-down center console has cup holders and hidden storage space. Mattress is filled with foam and batting. Has a premium quality wood frame for maximum durability. Solid print and tufted design. Sinuous springs made from heavy-gauge steel. Total four stainless steel legs; two straight front legs, two slanting back legs. One year limited warranty provided by Sauder. Attractive Cooper Convertible Sofa by Sauder is stylish and durable. With its easy click-clack adjustment, you can convert this sofa into a full size bed in less than a minute. 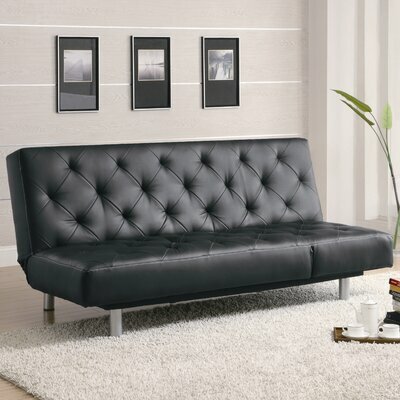 It features black colored DuraPlush® upholstery with tufted cushions for a chic and stylish look. This comfortable and cozy convertible sofa is a smart choice for enjoying your evenings at home while reading a book or watching your favorite TV show or convert it in to a bed for your overnight guests. Easy click-clack adjustment allows quick change from sofa to bed and vice versa. Sofa unfolds in to a full size bed. Seating capacity for 3 people. Bed can accommodate 2 adults or 4 kids. Wooden frame for long lasting durability. DuraPlush® upholstery is durable and resists wear. Back and seat are tufted for stylish look. Stylish stainless steel legs in chrome finish. Sauder provides one year limited product warranty.